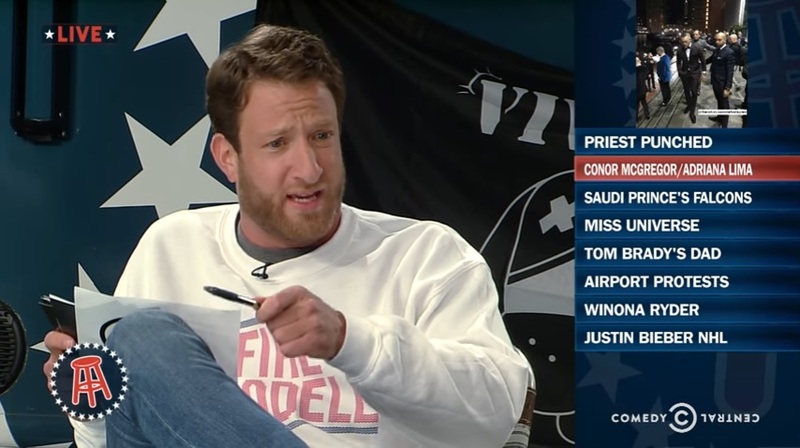 Barstool Rundown didn't do much better than the Futurama re-runs that aired the week before. Last week was a big one for Barstool Sports. The ever-growing sports media site took its act to TV, airing Barstool Rundown on Comedy Central at midnight from Monday through Thursday, leading up to the Super Bowl. This was a big opportunity for Barstool to show that it had broad, crossover appeal and could hang with the big boys of sports media. The broadcasts went off without incident and even created some buzz around their ratings. Sports TV Ratings pointed out that the show drew a much wider audience than FS1’s Undisputed and on the first night even approached ESPN’s First Take. Of course, those comparisons are a little misleading given that Barstool Rundown doesn’t air at the same time as the other sports talk shows and was carried on a network with significantly more reach than FS1. Still, you can see why that’s a tantalizing comparison. If Barstool can carry an audience as well as traditional sports debate shows with massive marketing campaigns behind them, despite partnering with a network that has always struggled to draw eyeballs to sports content, maybe there’s a real future for Rundown on TV. But when you delve into the numbers, you see that Barstool Rundown’s audience was certainly nothing special. Awful Announcing’s Douglas Pucci tracked down the viewership for the show, plus the viewership for the Futurama re-runs that aired in the same weekday midnight time slot the week before, along with their respective lead-ins. As you can see, Barstool Rundown was no better at keeping its lead-in than those Futurama re-runs. After the first night, when Barstool held most of its lead-in and drew a very solid audience, the viewership was indistinguishable from what Comedy Central was getting the previous week. In fact, Barstool Rundown drew fewer viewers every successive night it aired, and by Thursday it had fallen to an uninspiring low. Now, it’s admittedly unfair to consider these numbers absent of demographic context. As expected, Barstool Rundown seems to have reached the coveted 18-34 demographic, capitalizing on the young male niche that has fueled the web site’s popularity. A Barstool Sports friendly source says Barstool Rundown was Comedy Central’s top program last night among M18-34, beating Daily Show by +7%. That’s certainly valuable, and given that Barstool Rundown apparently performed well with its target demographic and presumably has very low overhead costs, we’ll concede that it probably makes for better programming than Futurama re-runs or whatever else Comedy Central might air at that time. As for Rundown’s future on late-night television? We’re not so sure.